A couple of months ago, after more than two years of dedicated service, my cycle computer finally gave up the ghost. It was a Garmin Edge 205, the base model and a refurbed one (though you wouldn't know the difference) and cost about 80 quid. I have to say that it's demise was rather theatrical, as well as final - diving off my handle bars before being run over by a passing car - but it did pave the way for a snazzy new replacement...! If you've got a bog standard cycle computer, and just want to know how fast you're going or how far you've been, you may not get the point. But if you do a lot of cycling, or go on tours, or are training and want to record your improvements, this kind of thing is invaluable. 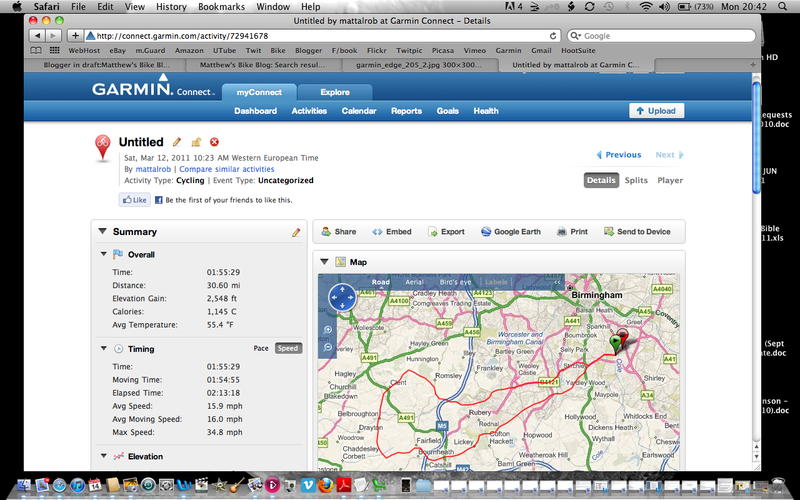 Not only does it show (and store) your speed, distance, time, max and average speed, altitude, gradient, calories consumed, etc - it will also upload that data to the excellent Garmin Connect web site, where it will also show your route on a map. How cool is that?! 1. These suckers are expensive. When I bought it, the Edge 205 was £150 and the Edge 705 (with on-screen maps - see below - and heart rate monitor) was £320!! 3. The battery life is awful. Forget new batteries once every couple of years, several times on tour rides over 100 miles the thing ran out of juice after 8 hours of cycling!! You'll need to have a charger with you and re-charge every night. Mine also got steamed up if rained for any length of time. This is where the good news starts again. You can now buy one of the new model Garmin Edge 500's for £140 (another £30 will get you a heart rate monitor which links wirelessly). These are much better machines, with 18 hours of battery life and a clearer display, plus additional data fields, including temperature. Mind, you'll still need to charge it every other day, but at least it won't conk out at the crucial moment. 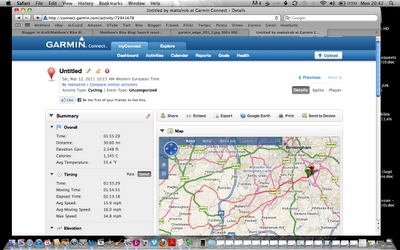 For £350 you can get an Edge 800 with a colour touch screen and an on-screen map (which looks pretty titchy). But what's the point?! I've got a GPS map, it's called my iPhone, so if I'm lost I can whip that out and find out where I am - like most people I spend 95% of the time on routes I already know, so there's no need to have a map up all the time. My only niggles would be that the satellite acquisition is a little slow, that the machine often settles on the wrong altitude (which, cleverly, can be corrected on Garmin Connect) and that the settings mean that the altitude on mine displays in metres (despite recording the distance in miles) so I have to convert it into feet in my head (100 feet = 30.48m, if you're asking). But nothing in life is perfect. So, if you're a reasonably serious cyclist who wants to know where you've been and how quickly you did it, buy a Garmin Edge 500.